If your middle or high school student has been playing the same instrument since grammar school and remains interested and committed to music, it maybe time to step-up to an instrument more appropriate for an advancing musician. Depending on the student’s proficiency, musical aspirations and the family budget, either an intermediate or professional quality instrument maybe the best choice as a student musician’s next instrument. Beginner instruments are constructed to be durable and easy for a new student to play. As your child becomes more advanced, tone quality, pitch and technique become more important considerations. Intermediate and professional instruments use different designs and are manufactured from upgraded materials to facilitate the needs of a musician tasked with playing more challenging musical passages. Younger children will generally start on a less than full sized stringed instrument and will need to migrate to a larger instrument as they grow. Once ready for their final full sized instrument you may opt for a beginner quality instrument; or if the student has been playing for several years an intermediate or advanced model may be a better investment. Stringed instrument outfits designed for students who have been playing for several years will be made using aged and seasoned hardwoods with more hand carving and finishing. They will be fitted with better quality bridges and strings and are supplied with carbon fiber or genuine wood bows…all of which contribute to a more satisfying musical experience for the player and their audience. When in doubt, check with your child’s music teacher to see if the time is right for an upgrade. 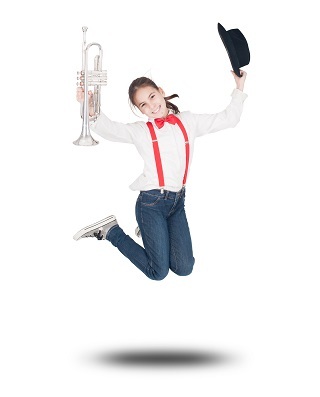 EasyRent customers may be able to use some or all of their accrued rental credit to make it more affordable to select the best instrument for their child as they continue on their musical journey. Please call 800-526-4593 to discuss your options with one of our customer service representatives or browse our Step Up Instruments for sale.